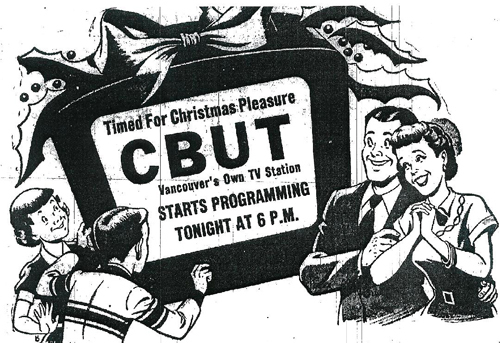 This is the first in a series of posts commemorating 60 years of CBUT television (CBC-TV) in Vancouver and British Columbia. Our current media culture is defined by television. Television has been, and still is, a part of our everyday lives – even in these digital days of live streaming and Netflix. But, how did this appliance of mass media, television, all begin? Locally, it all started with a 5,000 watt television station in Vancouver, British Columbia. CBUT, channel 2 station ID. Prospect Point, Stanley Park, 1961. Photo: Alvin Armstrong, CBC Vancouver Still Photo Collection. 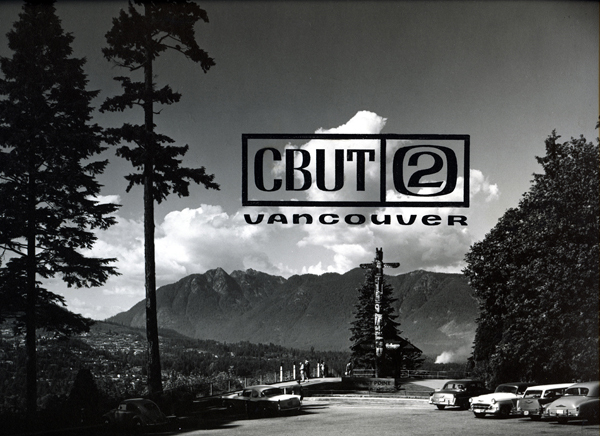 CBUT, Channel 2, Vancouver, officially began programming at 6.00 p.m., Wednesday, December 16th,1953 when a button pressed by A. Davidson Dunton, chairman of the CBC Board of Governors, set the inaugural transmission into motion. Prior to CBUT, the only television stations available to lower mainland residents originated from Washington State – KING Channel 5 in Seattle and KVOS Channel 12 in Bellingham. Another Seattle based TV station, KOMO Channel 4 began operation 6 days prior to CBUT on December 10, 1953. “A button is pressed and western Canada’s first television station is on the air!” Photo from CBC Times shows the exact moment that CBUT started 60 years of broadcasting. Engineers from CBC and the Marconi Co. predicted that the signal from CBUT would reach televisions on the east coast of Vancouver Island as far north as Comox, and as far south as Victoria. They also believed they could put a strong signal eastward to at least to Chilliwack in the Fraser Valley. CBUT transmitter building atop Mt. Seymour, 1954. Photo: Alvin Armstrong, CBC Vancouver Still Photo Collection. Later in 1953, the Canadian Department of Transport came out with a national assignment of television channels for Canada. 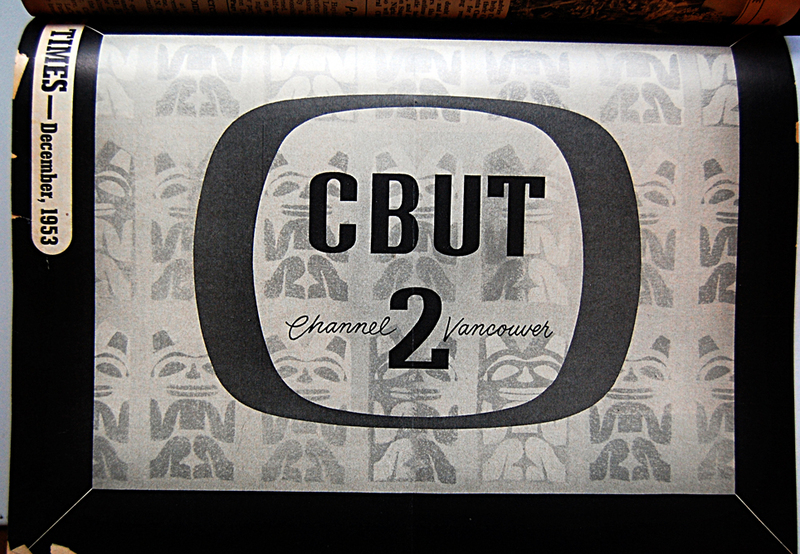 It was decided that CBUT would operate on channel 2 (initially CBUT was to be assigned channel 6, but it was thought that this would disrupt reception of Seattle’s KING-TV channel 5 in the area), and could have a maximum video power of 100,000 watts. 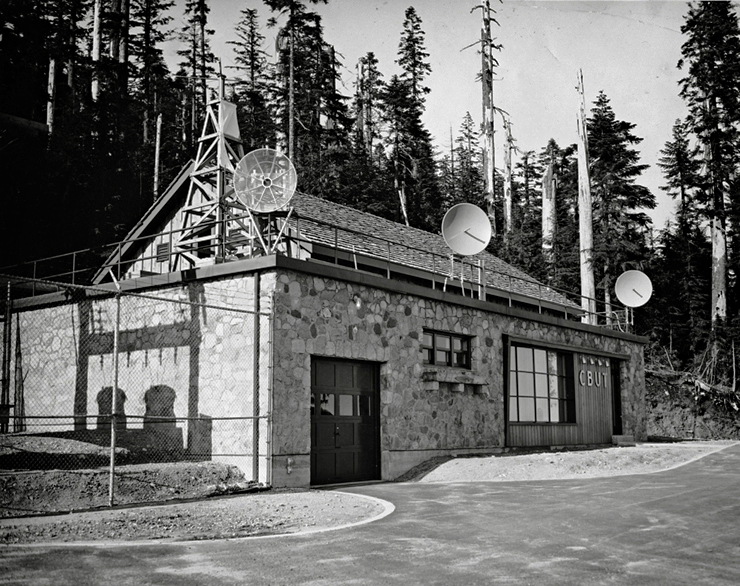 Until the permanent tower on Mount Seymour was operational, a temporary antenna on the roof of the Mt. Seymour transmitter building would be used. This would allow CBUT to start television service with film and kinescope recordings prior to the completion of studio facilities and transmitter tower in the spring of 1954. The temporary antenna was replaced by a new “12-stack directional high gain antenna” which increased CBUT radiation power from 5,000 watts to around 100,000 watts. 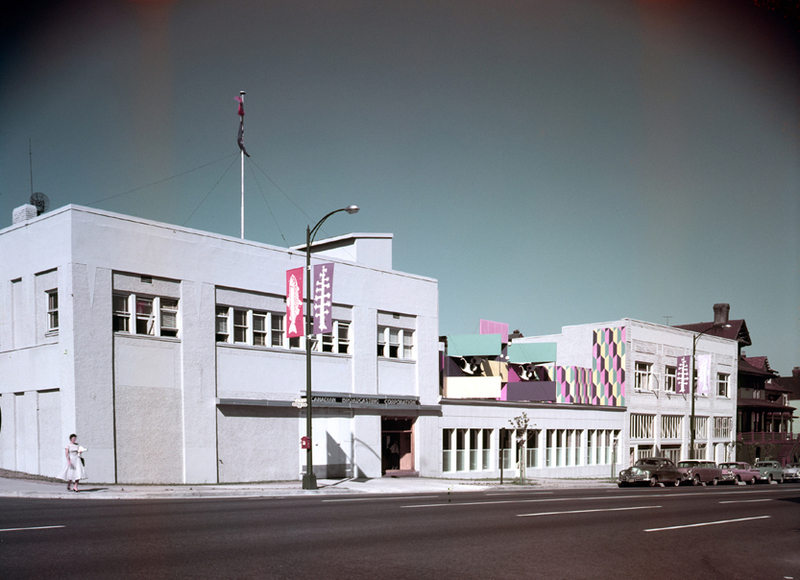 Exterior of the CBUT studio building at 1200 West Georgia, a converted Packard dealership. July, 1958. Photo: Alvin Armstrong, CBC Vancouver Still Photo Collection. By 5.00 o’clock Wednesday afternoon [Dec. 16] nearly 200 dignitaries were officially greeted in the unfinished studio building at 1200 West Georgia. CBC personnel conducted tours through the building: the studio floor and top floor where the telecine unit for transmission of films and kinescopes originate. Seven television receivers were positioned at strategic points throughout the studio, making program fare for the opening night available to those present. Tuesday [Dec. 15], press representatives from Vancouver and other parts of B.C. were taken by chartered bus to the transmitter site, 2700-foot level Mount Seymour. They returned to tour the studio building, which should be completed sometime next spring. Monday [Dec. 14], 150 members of CBC’s Vancouver staff were guests at the studio building. Reception by the viewing audience of CBUT’s first test pattern transmissions was marked with enthusiasm. Home set owners from Washington State, Vancouver Island and points east of Vancouver reported the [test] pattern was clear and sound was excellent. Among the local dignitaries invited to attend the official opening were: Premier W.A.C. Bennett, Mayor Fred Hume of Vancouver, UBC president Dr. Norman MacKenzie, Blair Clark, general manager of the B.E. Commonwealth Games Canada (1954) Society, and B.C. Electric president Dal Grauer. 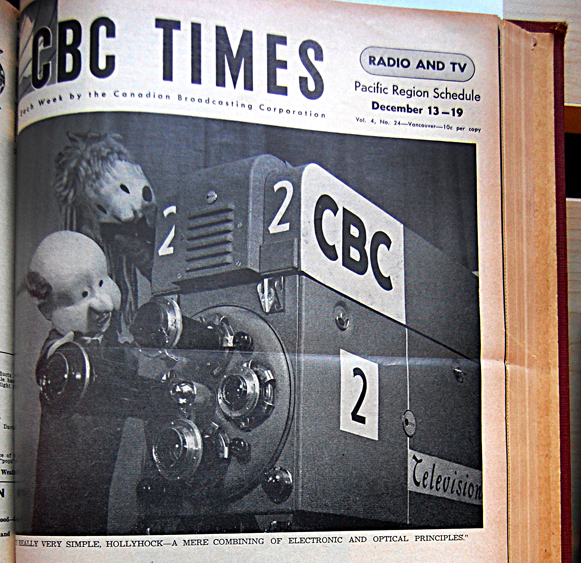 ‘CBC Times’ was the weekly program guide published by the CBC, to help Canadians keep track of it’s radio and television programming. 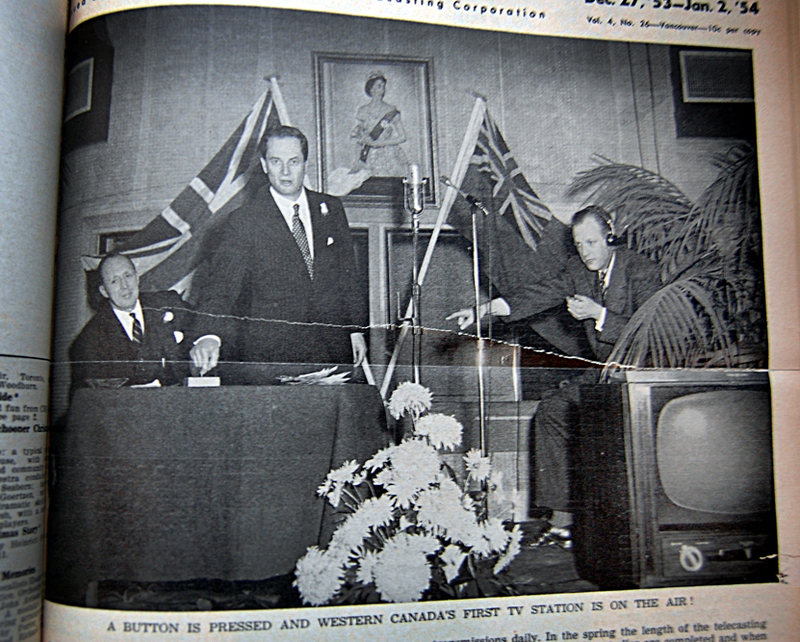 To mark the opening of CBUT, the fourth CBC-TV station in Canada, the December 13-19, 1954 issue of CBC Times contained a special TV supplement – providing readers the background to the establishment of CBUT, and pointing out its “significance in the development in the national television picture”. The cover was designed by CBUT graphic artist, Doug Stiles. Doug Stiles designed cover of Dec. 13- 19th, 1953 edition of the CBC Times special edition for the opening of CBUT. Several special programs marked the initial transmission of the station on Wednesday, December 16th, at 6.00 p.m. They consisted pre-taped (filmed) special greetings to the new station and entertainment programs that featured many “Vancouverites”. The initial regular broadcast schedule settled down to approximately five hours of programming per day. Its scope increased considerably in February 1954 with the arrival of the mobile television unit, and again later that spring when the completion of the CBUT television studios permitted the first live broadcasts [more about that in a later post]. CBUT opening day program schedule, Dec. 16, 1953. Typical early CBUT TV programming schedule (ca. early 1954). Note the broadcast of TV test pattern. Other than the local news, the only Canadian or local programs were Uncle Chichimus and Test Pattern. 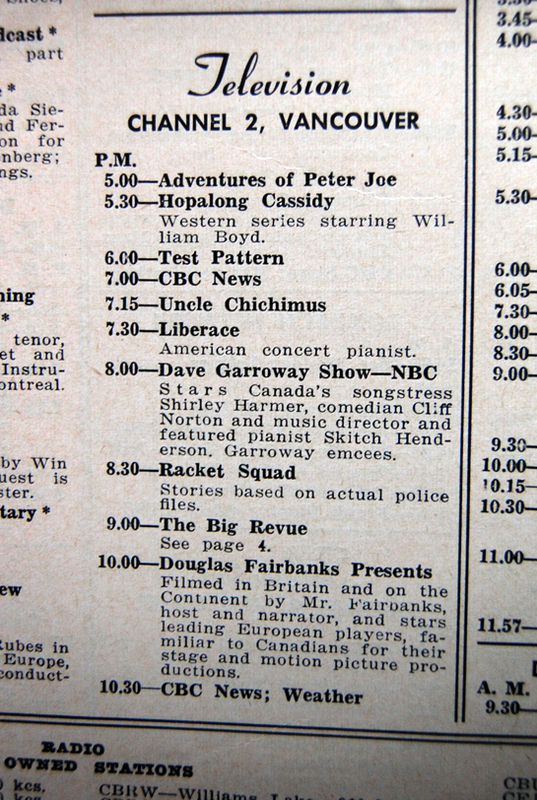 Uncle Chichimus and Hollyhock on cover of CBC Times, Pacific Region Schedule for Dec. 13-19, 1953. Uncle Chichimus and his sidekick (and niece) Hollyhock appeared on the cover of the CBC Times guide for Dec.13-19, 1953 – marking the first occasion on which a television subject was thrust into the CBC Times limelight. The creation of puppeteer, John Conway, it is highly appropriate that Uncle Chichimus should be the subject of this particular CBC Times cover. For not only was the chubby, bald puppet and his niece Hollyhock beloved regulars on CBC television broadcasts in the eastern Canada, but they were conceived here on the West Coast. In 1948, Ontario native, John Conway, moved to Vancouver to teach English at the University of British Columbia. While living in B.C., Conway and a fellow puppeteer toured the province with a new puppet troupe, and it was during this time that he formed the idea of the puppet characters, Uncle Chichimus (Chich) and Hollyhock (Holly). They made their television debut on the very first broadcast of CBLT -Toronto on September 8, 1952, marking the debut of English language television (The CBC’s French language television made it’s debut two days earlier in Montreal on Sept 6, 1952). They made an appearance on the schedule for CBUT’s first broadcast offering special greetings to the new TV station. Mock up of what a 1950s TV broadcasting test pattern would look like. Photo: Alvin Armstrong, CBC Vancouver still photograph collection. An integral part of television broadcasting in those early days was the transmission of the test pattern. 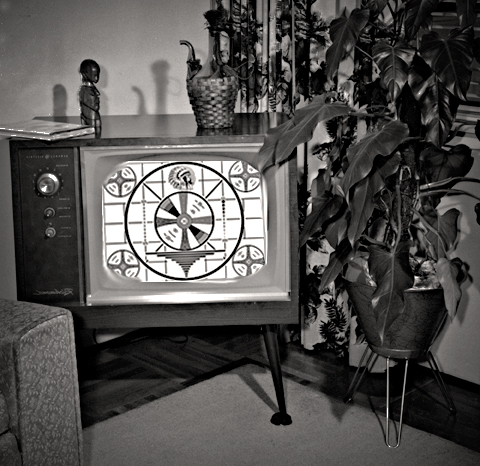 For the owner of a television set, it served as a yardstick by which the performance of the TV receiver could be measured – the more clearly and accurately a television receiver reproduces the pattern, the more perfect its performance. When television was in its infancy, the test pattern was not only broadcast during sign-on and sign-off but during the broadcast day. In the beginning, CBUT broadcast the (now iconic) Indian-head test pattern for an hour starting at 6:00 p.m. everyday. My mother recalls being fascinated by the broadcast of the test pattern, so much so that in those very early days of TV she claims it was one of her favorite shows! Eventually, improvements to television broadcasting equipment required less adjusting, and by the late 1950s the test pattern was seen less frequently. Except the occasional time when one was jolted awake by the annoying tone that accompanied test pattern, after they had fallen asleep with the TV on. The fundamentals behind the test pattern was explained to the novice television audience in a feature that appeared in the Dec. 13- 19th, 1953, special edition of the CBC Times. I imagine there was a spike in the sales of TV sets leading up to the launch of CBUT, as many people bought TV’s for the first time in their lives. The article explained that the most frequent problems with television reception are the “lack of linearity (resulting in picture distortion), lack of focus and the wrong setting of the brilliance and contrast controls”. The article goes on to explain, in detail, the various elements of the test pattern image and what they mean to proper television reception. The article ends with some friendly advice: “thus by regularly checking your set with the test pattern, your pictures will be reproduced more faithfully, and you will have the satisfaction of knowing when your set is operating perfectly”. Below is a short excerpt of some of the opening remarks that aired when CBUT first broadcast on December 16th, 1953. It is not exactly riveting television, but considering the CBUT television studios were still unfinished, they did not yet have their live studio cameras (Marconi MARK II and III’s) or mobile unit, and the Seymour transmitter tower was not yet built, it is nevertheless an impressive feat and momentous moment in the history of television in Vancouver. Also included on the clip are excerpts from the 1960 CBUT program “Image of CBUT” showing some ‘behind the scenes’ of early TV production. ▶ CBUT Opening broadcast, Dec. 16, 1953 (excerpts) and more – YouTube.